Yes we’re still here, we’re in serious discussion here at the keepdesigning.com dungeon, I mean office, about how we’re gonna bail out all these collapsing design firms- as always it’s keepdesigning to the rescue. 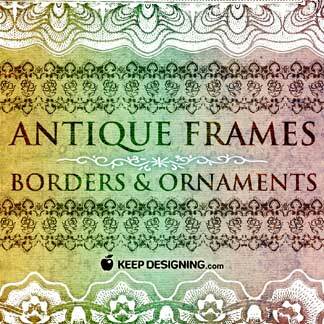 Today’s free vector download is a collection of antique frames and ornament vectors. 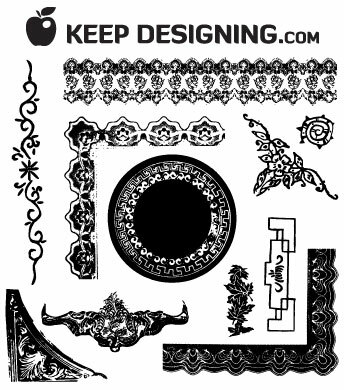 There are several vintage style, hand illustrated vectors in this download package that can be used to enhance the look of any design that’s lacking that certain liveliness. These are copyright free artworks that can be used for any personal or commercial use. The download zip file contains one eps that’s functional to anyone running adobe illustrator eight or higher. Thank you for giving freely such wonderful vectors & advice. I appreciate your talent & generosity very much! Thank you. The vector graphics are great!! they look very useful. good job! Thank you so much for share and freely! Thanks for sharing all your graphics, really helps me in my project. Your generiosity is much appreciated!! Thank you very much for great vectors! it’s a excellent image. if more awailable than send me fine detail image. i am intrested to do work on base. i am jewellery manufacturer. Thanks for sharing your work! Great to find quantity, free AND quality vectors… love your antique stuff. thank you for sharing, you’re the best! Muito legal esta p�gina de ornamentos, eu gosto muito de design, e com certeza: ser�o muito �teis. Just wanted to say thanx for the vectors. You have a great web-site here, keep it up. Thanx again. Many thanks for sharing this with the beginners like me. thank you so much… realy it helps a lot for a designer like me!!! Thankyou very much for sharing this bro…. Thanks for the antiques. Great post. it is so nice that you share your grateful amazing work. thank you! loving these frames and patterns. thanks! perfect for some of the gothy designs i’m working on.